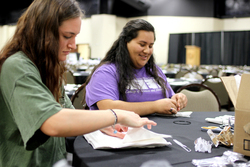 Stephen F. Austin State University interior design senior Calli Blankenship of Livingston, left, and hospitality administration senior Yessenia Ramirez of Houston help prepare silverware for the annual Chairished Blessings fundraiser. More than 100 students in SFA's School of Human Sciences helped coordinate this event, which benefited the nonprofit Christian organization Love in the Name of Christ. NACOGDOCHES, Texas - More than 100 Stephen F. Austin State University students enrolled in the School of Human Sciences applied their skills during the annual "Chairished" Blessings fundraiser held recently at the Nacogdoches Exposition and Civic Center. Interior design, merchandising and hospitality students were among the participants during this year's event and played active roles in making it a success. Interior design students refinished furniture for a design competition. Both interior and fashion merchandising students created table centerpieces, and hospitality administration students prepared and served the meal. All majors from the School of Human Sciences assisted that evening greeting, taking tickets, selling and serving cakes, and selling and working the door prizes and raffle tickets. "One of the reasons we get all of the students in the School of Human Sciences involved is because we want them to know what it's like to be active in their community," said Sally Ann Swearingen, associate professor in the School of Human Sciences. "We are not just teaching a major. We are teaching students how to incorporate their talents and skills to serve others." The annual fundraiser benefited Love in the Name of Christ, a nonprofit Christian organization in Nacogdoches dedicated to serving local citizens in need. Chairished Blessings featured dinner, a silent auction and a design competition. "This event's goal is to raise money for the projects Love INC provides for the community," Swearingen said. "One of the projects is raising money to help construct a shower and laundry facility." Prior to the event, SFA students helped set up tables by creating centerpieces. Many also helped assemble gift baskets as auction items. "Working this event has taught me a lot about what goes on behind the scenes of a project," said Calli Blankenship, senior interior design major from Livingston, Texas, who helped the interior design students refinish furniture for the competition. "Making connections and networking with people to help you is so important." Houston senior Yessenia Ramirez, a hospitality major focusing on travel and tourism, was a first-time participant. "The tourism industry is all about bringing people to visit different communities, so I feel hosting an event as big as this one is a great way to do that," Ramirez said. "Hospitality involves service to people, and this is an example of what we will be doing later and a great experience for us."